Precious, spacious, expressive and minimal. 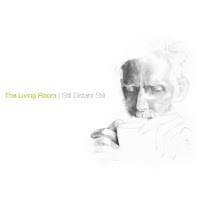 All the best words to describe this latest experimental trio from Norway featuring Torben Snekkestad, Thomas Stronen and Soren Kjaergaard as The Living Room. Their highly impressive debut, Still Distant Still, was built out of a number of live performances and in the studio that energy is just as intense and beautiful. Like its title, the album is filled with space that holds you in place but displays a freedom and unique curiosity of performance that leaves you wondering what note will be played next. "Tremelo Hiving" quietly moves along with long breathy squeals by Snekkestad and crackling improvised tones by both Kjaergaard and Stronen. On "Still Distant Still," the trio execute a fine pattern of improvised notes led by Snekkestad and rolling divergent notes by Kjaergaard. Snekkestad stretches the air in the middle of the piece while Kjaergaard and Stronen add a layer of haunting effects over the top of notes. "Rainbow Stomp" is the dark, loud polar opposite to "Still Distant Still." It's builds viciously from the start, an intense discordant exchange between all members sets the path for this number. The space is consumed by tweaks, squeals, crackles, muted manipulations and pulses that all form a beautiful cacophony that carries out to it's ending. "Mustard Variations" could sit nicely inside the John Zorn songbook. It's short, staccato patterns reign down on you like large balls of hail. Stronen and Snekkestad are the most prominent here with a blast of humour and subtle rhythmic tones and almost suggest they were going to break into a melody. A raucous of noise but still revolving around the theme of experimenting with sound. Still Distant Still is a powerful debut from three well known and prolific improvisers that demands you seeking it out. The Living Room hopefully is not just a one off. Let's hope we get a few more albums out of this trio in the close future. Excellent stuff.